The City of Muscatine Levee Breach Scenario maps are published online along with the Army Corps of Engineers study presentation. Redlands, California—The people of Muscatine, Iowa, enjoy the beauty and the power of the Mississippi River, but they live in fear of floods. It's only a matter of time before devastating floods, like those in 1993 and 2008 in eastern Iowa and 2011 in western Iowa, strike again, according to experts at the University of Iowa's Stanley Hydraulics Lab and the Iowa Department of Natural Resources. To diminish worries and mitigate risks, officials from the City of Muscatine worked with the Army Corps of Engineers, using Esri ArcGIS technology, to create maps of hypothetical levee breach scenarios along the levee system. "High water is an annual occurrence along the Mississippi River, threatening life, commerce, and agricultural interests," said Randy Hill, public works director for Muscatine. "Proactive planning is an effort to improve emergency response and communication in the event of a catastrophe." To build the maps the city needed for planning, Mark Yerington, GIS systems analyst for the Muscatine Area Geographic Information Consortium (MAGIC), and Mark Warren, MAGIC GIS manager, worked with ArcGIS Online. The MAGIC team created an interactive web map that can be shared internally and with the public via the web on PCs, smartphones, and tablets. Security for all applications is controlled locally on the MAGIC server. 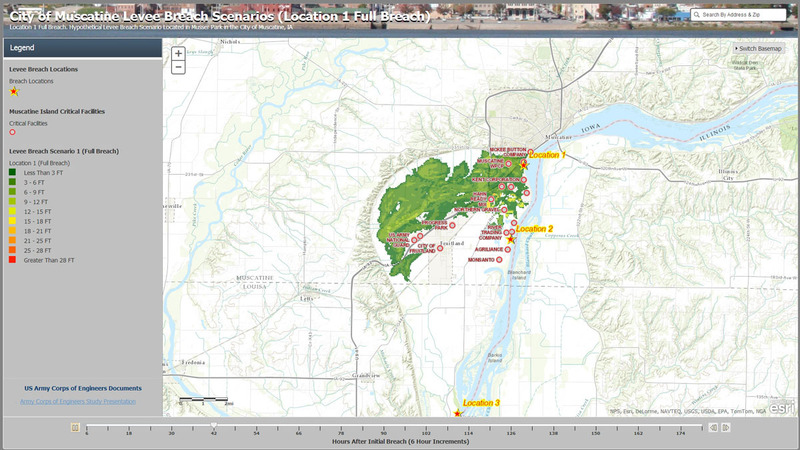 "The application templates on ArcGIS Online are easy to use," said Yerington. "This is a great example of local and federal government working together to create a great product for the citizens' benefit." The City of Muscatine Levee Breach Scenarios maps are published online along with the Army Corps of Engineers study presentation.